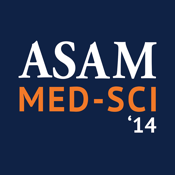 The ASAM Med-Sci 2014 mobile application allows you to browse through the presentations, poster abstracts and exhibitors from the 2014 event. Many of the presentation slides and posters are available for download. You can take notes adjacent presentation slides and posters, as well as draw directly on the slides. Additionally, you can even share information with attendees and colleagues with social media applications, emailing, and in-app messaging.